At AddThis we have the best geeks on the planet, and it’s our duty to share their knowledge and passion with the world. From time to time we hand the reins over to one of our teammates in a series we call, Talk Nerdy to Me. Principal Software Engineer Kirk Elliott’s first post, 7 Things to Consider When Making iOS and Android Apps with Cordova or PhoneGap, got a lot of love, so we’re excited to have him back. Kirk enjoys DJing in the Baltimore Club Music scene, tidy code frameworks, and definitely being called Cappin’ Kirk by his co-workers. Should you use a Framework or a Static Library? Can you use Swift or Objective-C? How can you export your final builds? How will you provide instructions to use your library in a manner that will be easy to understand? This post will attempt to answer these questions based on your project’s concerns and provide additional information and resources to make your static library or framework project go smoothly. 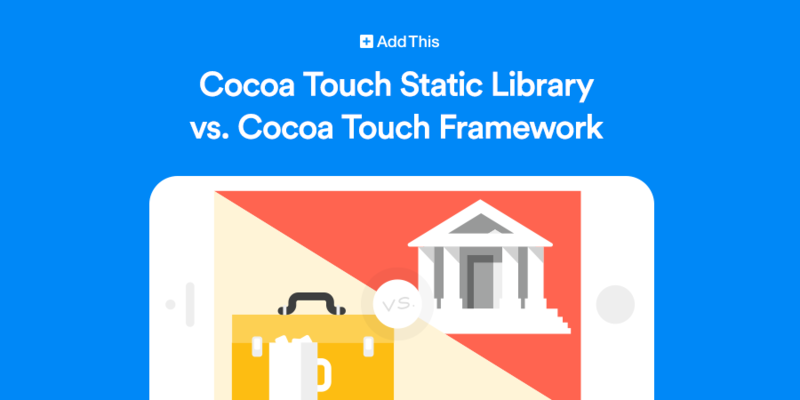 The first thing to know about is the difference between a Cocoa Touch Static Library (aka static library) and a Cocoa Touch Framework (aka framework). From a practical perspective, frameworks are only supported from iOS 8 onwards, whereas static libraries go “all the way back” to iOS 6, which is as far back as you can build an Xcode project using Xcode 7. If you need to support iOS versions before iOS 8, you should consider using a Cocoa Touch Static Library and writing your code in Objective-C. The next thing you should be aware of is that Cocoa Touch Static Libraries do not support Swift. So if you decide to use a Cocoa Touch Static Library, you need to use Objective-C. On that topic, Swift is supported back to iOS 7. If you need to support iOS 6 then Swift is definitely “off the table”. If you need to support iOS 7 and you want to use Swift, you will need to provide your source files to be included as raw files in the host app project. Otherwise if you only need to support iOS 8 and onwards, then you can create a Cocoa Touch Framework in Swift. The main thing to consider thus far is the base deployment target of apps that will be using your framework. If you are creating a framework for large scale distribution, you should be aware that many big publishers are still (at the time of this writing) supporting iOS 7 as a base deployment target. Generally the base deployment target is two versions below the latest one, so when iOS 10 is released (likely around 14-09-2016), we can expect the base to shift to iOS 8 for many publishers. At the time of writing this iOS 9 has 84% adoption, iOS 8 has 11%, and earlier versions of iOS comprise the remaining 5%. After you have built your framework, distribution will become your most important concern. Even though you have an Xcode project of type framework or static library, how do you provide your resource to others? Additionally, how do you provide instructions that are simple and easy to understand for the users of your product? If you are going to create a Cocoa Touch Framework, kodmunki has the best guide out there. If you go with a Cocoa Touch Static Library instead, you should consider the Ray Wenderlich guide. Start with the section titled “Universal Frameworks”. Both of these are excellent guides that I have personally built frameworks from and these have been selected from all of the other pages on the Internet as the best sources have found to date. In both of these approaches you will want to make sure that your Archive project target Build Settings has Build Active Architecture Only set to NO and Defines Module set to YES. Aside from that you should probably also define a User-Defined Build Setting of “BITCODE_GENERATION_MODE” with a value of “bitcode”, especially if you have bit code-related errors or warnings in your host app. It is not recommended “bitcode”, especially if you have bit code-related errors or warnings in your host app. It is not recommended that you disable bitcode generation in your host app in order to remove errors generated from your framework/static library product. After you build and export your framework, it is important that you are able to include it in a host app for testing. You should be able to build and run on Simulator, physical device, and for “Generic iOS Device” without error. Beyond that you should also be certain that you can Archive your project with the framework included and export the app as well as submit to the App Store without error. I have seen failures occur at various stages in this process without previous error or warning and you should not consider your product complete until all of these boxes have been checked. Cocoa Touch Framework aka dynamic library Swift or Objective-C only supported on iOS 8 and later, fails during app submission if target <= iOS7 compiles to .framework Cocoa Touch Static Library aka static library only Objective-C (Swift is not supported) compiles to .lib supported “all the way down” to iOS 6. Hopefully these resources will save you time and effort in your next iOS project!